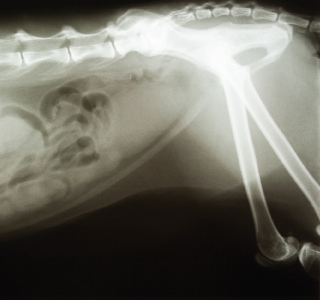 Veterinary diagnostic imaging includes radiographs (x-rays), ultrasound, MRIs and CT scans, all of which are used as diagnostic tools to collect information on your dog's health. The vast majority of imaging is non-invasive and completely painless. However, some imaging may require sedation or even anesthesia because the dog must be kept still to allow for adequate images to be produced. Vetearinarians use these images to collect information on your dog to help them to make a medical and sometimes surgical plan. In modern scanning systems like the ones Pleasant Hill Animal Hospital has on-site and uses on our canine patients, the sound beam sweeps through the body many times per second. This produces a dynamic, real-time image that changes as the dog ultrasound device moves across a dog's body. We can use the results of an ultrasound to determine what is ailing your dog, and to devise the most effective treatment protocol. A dog MRI is not used as regularly as an x-ray or ultrasound because the equipment is very expensive, very large, and requires specially trained technicians to operate. The Doctors at Pleasant Hill Animal Hospital refer our patients out to a specialty or university hospital to for comprehensive MRI services. Just like MRI equipment, CT scan equipment is very expensive, large and requires trained technicians to operate. Therefore, the Doctors at Pleasant Hill Animal Hospital refer our patients out to a specialty or university hospital to for CT scans.